I think the best solution, or at least the awesomest, is to use a step-up transformer. I don’t need a transformer because the transducer I’m using is pretty low-voltage, so I can use it with a reasonable power supply. A higher voltage transducer such as the Meas-Spec US40KT-01 [PDF], which operates at up to 300 V peak-to-peak, would definitely need a transformer. The main downside of using a transformer is that I don’t know very much about using transformers, and also I suspect the circuitry will be more expensive (I do have room in my budget). 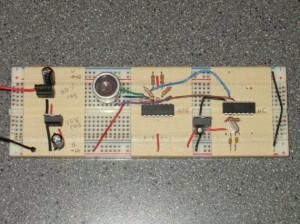 The upside is that it will produce a high voltage signal and should be a simpler circuit once I figure it out. 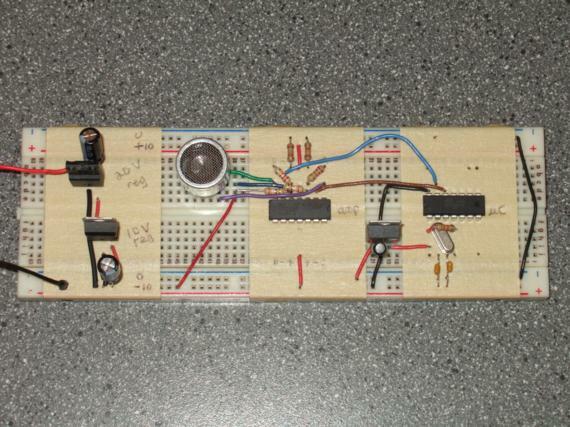 I have a little microcontroller generating a 0 V to 5 V square wave at 40 kHz. Originally I had some kind of vague notion that I would use an amplifer to bump the micro’s output up to 0 V to 20 V.
My stumbling block is that the microcontroller is grounded to the -10 V rail, so according to the op-amp, the micro’s outputs are actually from -10 V to -5 V. How do you amplify that to a signal that goes from -10 V to +10 V? I’m sure there’s a slick way of doing it by mucking around with virtual ground, but I gave up pretty quickly. Suddenly it’s clear why I wrote a log entry about the Schmitt trigger! Another reason: I was too busy to make a long log entry about something more complicated. Originally I learned about the Schmitt trigger trying to figure out how to turn the receiver’s analog output into a digital signal. It transforms a signal of arbitrary amplitude into a digital signal flipping back and forth between the op-amp’s two power rails. I was going to turn the ±10 V output into a 0-5 V output by adding a diode to block the -10 V signal and a voltage divider to turn the +10 V signal into +5 V.
Anyway, the Schmitt trigger produces a ±10 V signal and hey, that’s exactly what I want, so I just made a Schmitt trigger with threshold levels between -10 V and -5 V (that being, again, the microcontroller’s output from the op-amp’s perspective). It works okay. The ±10 V waveform is more trapezoidal than square. Square waves are always are kind of trapezoidal, but this one is really trapezoidal. But it’s square enough and the acoustic signal it produces is fine. 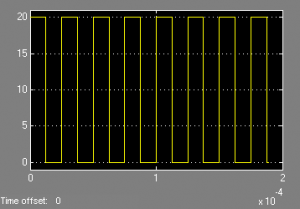 The raw output of a receiver module receiving my signal is indistinguishable from that of the SRF04 I’m trying to copy, except my signal is marginally more powerful (since I’m sending the transducer a slightly higher voltage). So that’s what I’m using as a transmitter for now. The plan is to upgrade the transducer and switch to a transformer amplifier at some point down the line. This transmitter functions as a proof-of-concept that works well in air (how to get it working underwater is TBD). Visualization of the output waveform. The modem encodes data in acoustic pulses, as shown above. The image is a representation of a single 1 bit, encoded as eight consecutive pulses at 40 kHz. I will discuss this more later.